Beating Paruresis (Shy Bladder): Shy Bladder? You're not alone! No, I haven't given up. I made huge progress, from only being able to go in a stall while sitting down (to reduce the noise) to being able to go at the urinal in a quiet bathroom. I'm not cured, some experts say that once you've experienced Shy Bladder you will always have some risk of it occurring to you again. But through my journey I learned a lot and came to understand my condition better. For instance, if I know you well enough to have a conversation at the urinal I will be able to go with no problem. Knowing that I can succeed in that situation means I can go to the bathroom with a friend and be "normal". Now I understand the triggers to my Shy Bladder and am more aware of avoidance behaviors. I know what I have to do to continue my progress but I changed jobs and don't have a good "practice bathroom" at the moment. But things change and when they do I'll post again here. Maybe I'll start suffering with worse Shy Bladder again or maybe I'll pursue Cognitive Behavioral Therapy to see how effective that is. Please post your own experiences in the comments! I hope this old blog gives other people hope that they can make big changes in their lives. It isn't easy but you can claw back your life and dignity as I have done. Good luck on your own journey! I found that remembering scenes from a funny show works pretty well for me (I prefer Southpark episodes). I graduated from sitting down in a stall to using a urinal just moments after the person next to me steps away. I have quite severe paruresis, sometimes I cannot even go while sitting in a locked stall. I am thinking about standing up and trying that way, but what happens if you cannot go and others recognize it ? How do you handle that situation ? It is very embarassing. I know that no one cares if you pee or not, but I cannot convience my subconscious about that. *Everyone* has had an experience where they are unable to go and understands how frustrating or embarrasing it can be. One of the problems with suffering from Paruresis (Shy Bladder) is that you have an exaggerated concern for how you are judged in the bathroom. It's like a little voice running a tape over and over saying "I can't go, what if someone notices that I can't go, what are they thinking? Do they think I'm weird? What if they think I'm some weirdo? I can't go..."
"Normal" people don't have this tape playing but they are not exactly themselves either. The act of urinating makes us very vulnerable so when normal people go into a bathroom they are subdued and try not to be noticed. Nobody is trying to draw attention to themselves and neither do they want to look at anyone else. In this environment it is very unlikely that anyone will notice that you are unable to go. If they do notice it they are very unlikely to say anything. One way to test this is to go into a bathroom and into a stall. Stand there for a few minutes and then come out again. Nobody will even look at you. You can try the same at a urinal. Nobody will notice. One thing I tried that really helped me was to use a stall and try to make as much noise as possible while urinating. Really go for the big splash. This helped in two ways. #1 it stopped me obsessing over people hearing me pee and #2 it made me feel like the big dog in the bathroom. If there's one thing we shy-bladder sufferers are good at it's holding our pee. When we have to go we can really make a noise! Use that to your advantage! Good luck on your journey, you *CAN* beat this condition and get on with your life. Thanks for the reply to my Anonymous comment. I think you helped a lot of people with your blog, it is really appreciated. I agree with your thoughts on the anxiety. Making noise might help for me too, the biggest problem for me that here in the US a stall walls do not go from the floor up to ceiling (like in Europe, where I come from), which results in much less privacy, e.g. they can see my face. But they DO NOT, your are right. This is root of the issue, I know they do not care,but my mind "does not think so". As initiating the urine flow is very complex dialogue between nervous systems and the bladder muscles. First my subconscious should think that way. I am reading Sofier's book, I think gradual exposure might help, time will tell. In terms of fluids I experienced that anything that contains caffeine (eg. : coffee, tea, coke, energy drinks) can increase the anxiety (as it increases the blood pressure). Although caffeine stimulates the bladder muscles to make it easier to go in normal "safe" situations (like at home, or alone in a public restroom) it does not work for me when in crowded public restrooms. These days I go for the pure (spring) water. In addition it is healthier. Did you have the same experience with fluids ? Besides to the fluid quality holding the urine for long time decreases the chance for me to go even in safe situations. Because it is harder to loosen up the tense pelvic sphincter muscles. I think others have similar experience. Is there any technique to relax these muscles ? @Steve, I too am a European who has travelled and lived in the USA and experienced American stalls: Huge gap at the bottom of the door, huge one at the top of the door, big gaps in the construction. Strangely on returning to Europe I sometimes get a very mild feeling of claustropobia from the floor-to-ceiling 100% sealed euro-stalls. Regarding the anxiety and the holding of water. When I was working hard at progressing I was constantly swigging from a 20oz bottle of mineral water. I would also drink soda such as coke which I find very diuretic and I drank a lot of coffee. To practice graduated exposure therapy you have to have some level of urgency to go and drinking is really the only way to make that happen often enough so that you can practice. #1 Drop down at least one level of difficulty in your exposure scale (e.g. if you've progressed to door-open stall, close the door). #3 Think about trying some anti-anxiety drugs. They might help lower your background level of anxiety in this situation. This is a difficult one and I'm not a doctor, just a guy who fought back his shy bladder to manageable levels through graduated exposure therapy and keeping an online diary of progress. I think that the anxiety you feel with a full bladder is directly related to the thought that you will have to face the bathroom. If you can make a start with graduated exposure you should be able to decrease that pre-bathroom anxiety too. I used to get a rush of adrenaline as I approached a bathroom but practicing graduated exposure has reduced that to nearly nothing. Thanks for posting Steve, there is a huge "lurker" audience here desperate for information and for success stories. Let us know how you get on! The big problem facing paruretics is keeping those negative voices quiet. Why me? What's wrong with me? Why doesnt it affect other people? They are all examples of questions we've all wrestled with, but they arent helpful. Humans are meant to be apprehensive while urinating, it's a survival technique, so it doesnt take a lot to engage the "fight or flight" response. As a paruretic it is vital to constantly remind yourself that there is no "real" danger while urinating. As you are probably aware this is not as easy as it sounds; so it is worhtwhile investing time and money learning skills and techniques from the fields of CBT and NLP. They are designed to help you silence the demons in your head so you can start that long road to recovery. Steve: I experience the same situation of "too much build up". I also agree with the response of it adding to anxiety; HOWEVER, I have been experimenting at home to understand my voluntary control and if I wait too long, it is like the naturally restrictive mode my body is in makes it latched in that condition, resulting in the delay (hesitancy) being longer (it has been clenched so tight and so long, it takes even more time to let go). I think crossing this physical threshold just adds to the vicious cycle of anxiety build up during the waiting period (hesitancy). I'm a mom and my 10 year old son just told me that he has shy bladder (although he didn't call it that). Ever since he was potty trained, he has been allowed to "go" outside while we're hiking or other appropriate outdoor areas, and of course in the normal style, too. At home, in the mall, at the grocery store, etc. However, I didn't allow him to use the public Men's room unless my husband was there with him, until just about a year ago, because I was concerned about weirdos in the Men's room, and I wouldn't be in there to watch over him. So he would always go in with me and use a stall in the ladies room, but I think that's pretty normal for young boys when they're out with their moms. When he started to go in the Men's room with his dad, or alone as he got older, and use a urinal, he would SOMETIMES "freeze up" and have to wait a while before he could try again. I thought this was something that happened to all guys, and he would eventually get over it as he got used to the whole urinal situation. Anyway, now he says that in the boys' room at school, he ALWAYS has to use a stall, and he's so upset by it that he cried when he told me about it. I feel so awful for him, and I don't know what started it, or what has caused it to get so much worse. Does anyone know if these techniques, such as Gradual Exposure Therapy, will work with a 10 year old? Obviously, I would have to help him with it, and I don't know if that would make it even worse. Also, I read that some people think Paruresis is caused by some type of trauma such as sexual abuse. I cannot believe that's this is always the cause, because he's never had anything like that happen. What is your experience as far as why you think most people develop this condition? Having a child with Shy Bladder is probably worse than having it yourself so I empathize with your situation. One of the reasons I wanted to deal with my own problem was so that I could be a good role model to my own male children. I am not a psychologist or a physician of any sort and I think you should consult with a urologist first to ensure that your child doesn't have any physical problem. But having said that, the fact that your son is able to talk about it is good I think. I found an immense relief in discovering that I wasn't weird, I had a condition with a name. It made it easier to talk about it and even provided some relief from the symptoms. He may find the same. My paruresis/shy bladder didn't start as a result of abuse. I don't even recall what started it but I don't have any memories of trauma. Many people are the same. Graduated Exposure Therapy might work for your son but I'm not sure how to suggest going about it because you are his Mom. On the one hand he might not have a problem going with your nearby because shy bladder is usually worst around strangers and in situations the subconscious mind considers "unsafe". On the other hand he might have reached an age where he is uncomfortable going with his mom nearby. Since your son is 10 I think the first step might be to discuss the possibility that it's paruresis and talk with him about next steps. You might suggest having a check with a urologist and if that comes back clear you can discuss steps after that such as a childrens psychologist. Steven Soifer over at paruresis.org may be able to help you identify a psychologist with experience of this in children. Hopefully others here will chime in with some advice and experience that will help you and your son. I hate having a shy bladder. It's so bad I can't hang out with friends, go to nice places, travel, or even go on a date. I don't know how it happened, but I feel like I'm locked down. I worry about my future constantly and am scared of how I am going to live. Is there any hope? I've improved to being able to use the bathroom anywhere as long as no one is there with me. As soon as someone enters, I lock up. Sigh. What can I do? I'm so tired of living like this. While on a friends boat miles away from a bathroom I had to take a pee and was told to go in the lake. I jumped in and couldn't even piss while in the water. After making the huge mistake of drinking and driving I was charged with D.U.I. When I was court ordered to take a drug urine test and was unable due to shy bladder, I was labeled a "drug addict" because the judge thought I was hiding something. 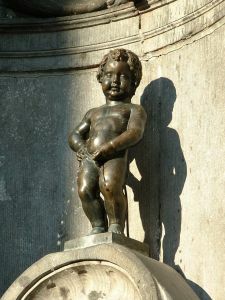 Shy bladder has been a huge burden all my life.